comrade powell wrote: However I'm concerned to learn from Sally that she had not seen them before you shared them with the world. That is worrying and does rather support my increasing feelings that a lot of what is posted on here cannot be taken at face value. I am going to step back from the discussions now and perhaps come back when firm proposals and plans are published. 1) Opposition to the proposals expressed here seems to essentially boil down to the argument of 'neh, students'. A proposal of which student accommodation is only a small part is being deliberately portrayed as being all about student accommodation - including bits where it clearly isn't (e.g. the Magic Wok). 2) So far from what I can see there has been only one person on here vociferously opposing the scheme. The photograph from the protest held recently had a hand full of people in it. If this was the big issue amongst "the community" that it's being suggested it is, surely there would be at least one or two more people on here giving their opinions ? It all sounds like a one man crusade at the moment. 3) There is an underlying unpleasantness in the tone of some of the comments being posted on here. There are many Bath City fans who also have questions and reservations about the proposals for the stadium, but acting in that way is likely to turn some of those people off this campaign. 4) In my opinion spreading students evenly around the city of Bath is a bloody good thing. God knows there are parts of the city that could do with a limited influx of young people with time and money to spend. It might make the difference between a shop, pub, post office or bus route remaining open or closing. Students are not just the problem they're sometimes made out to be. Often they bring localised benefits to neighbourhoods. What an offensive thing to say. But you do say an awful lot without ever addressing any direct questions. You appear to be under the impression that if 88 people say they don't like student accommodation then a developer should remove it entirely from their proposals. Just because they still have it in doesn't mean they didn't listen. It means the scheme doesn't stack up without it. No one can afford to provide social housing without having something else to pay for it. That is what I learn. I think it's winding down time now. The discussion has covered most of the bases I wanted to cover, so many thanks for your points. To answer a few comments. SteveBradley wrote: 1) Opposition to the proposals expressed here seems to essentially boil down to the argument of 'neh, students'. Except that it doesn't. I've taken time latterly to show you that my personal preference is for balanced communities, where students are respected but not overly prioritised to the detriment of other social groups and communities. This is essentially the same sort of values framework as underpins the Council's 10% cap on student HMOs. SteveBradley wrote: 2) So far from what I can see there has been only one person on here vociferously opposing the scheme. The photograph from the protest held recently had a hand full of people in it. If this was the big issue amongst "the community" that it's being suggested it is, surely there would be at least one or two more people on here giving their opinions ? It all sounds like a one man crusade at the moment. Simple answer. Join the Facebook group Proud of Twerton, Whiteway and Southdown. Then you'll be able to engage with lots of residents on various threads about the subject. Here are a sample: https://tinyurl.com/yaza32uq . There are a couple of City fans defending the redevelopment, but lots of angry and worried comments about student blocks, parking issues, and so forth. You won't like everything you read. I've been engaging with the Twerton community for over ten years and I can tell you: it's very rare for residents to demonstrate like this at all. The fact that they've done it at all suggests significant strength of feeling among the community. The simple reason why no-one else in the group has been debating on here, is I haven't shared the link. SteveBradley wrote: 3) There is an underlying unpleasantness in the tone of some of the comments being posted on here. There are many Bath City fans who also have questions and reservations about the proposals for the stadium, but acting in that way is likely to turn some of those people off this campaign. I'm afraid I can't agree. I've had my share of personalisations, ad hominems, strawman arguments and false claims about my motives from multiple commentators. When that happens, people can expect a stiff response. If this puts fans off the need to treat Twerton with more moral responsibility than has been shown so far, then that will be their prerogative. SteveBradley wrote: 4) In my opinion spreading students evenly around the city of Bath is a bloody good thing. To a degree, yes, there are some advantages in that. But not to undermine the principle of balanced communities. There are challenges for the football club in this, aren't there? The club favours student blocks because that's where the money is. Students end up paying out high rents for small living space. So how far is the club propping itself up, by lining up lots of students for future student debt? No it isn't. I'm trying to teach you community savvy. You're bad at debate because you don't grasp the points. Your latest reference to the poll is another point taken out of context, leading to another unhelpful misrepresentation of what was being said. I don't want to unpack it all now, because it just muddies the waters. If you take nothing else away from this discussion, keep in mind that public engagement/consultation isn't listening per se. People use engagement to placate communities, or to give the appearance of listening, or to engage in tokenism -- offering something small in the guise of compromise. You get it in most forms of human organisation, so there's an important life lesson. While forum members are free to respond however they wish, can I suggest that this guy has been given more than enough air time and that any future posts are not responded to. To accuse Benny of being bad at debate is both rude and laughable when considering many of the 24 posts he has made in the past week. And yet I see that he has not responded to my criticism of his publishing of the 'minutes' of his meeting with Sally Harris. comrade powell wrote: Good evening. I'm a member of the football club's board which you are using this forum to attack. I'm not going to respond to your claims, partly as I'm presently abroad and therefore out of the loop and also because I feel that you should be raising your concerns with the relevant people at the club. It's good to learn that you have met with Sally Harris and I read your minutes with interest. However I'm concerned to learn from Sally that she had not seen them before you shared them with the world. I'm hoping to hear from her tomorrow that she is happy with the accuracy of what you have published. Thank you, but I think it correct to address my points to the whole football club community. I like Sally and, at the meeting we had, I made it clear that I would type up the notes I took and distribute them. Both Sally and the other people at the meeting interact with the Facebook group: Proud of Twerton, Whiteway and Southdown. I thought by posting the minutes there, these people would all pick them up. I also emailed them to the address: redevelopment@bathcityfootballclub.co.uk and thought she would get them from there. I'm not used to making minutes. All I can tell you, is I wrote down the things people said, as they were saying them, and then typed them up. comrade powell wrote: While forum members are free to respond however they wish, can I suggest that this guy has been given more than enough air time and that any future posts are not responded to. And that sums up the debate side from the Bath City FC crew. All you're left with is personalisations. A sure sign that the issues I've highlighted are indefensible. A question that keeps coming to my mind, is how far the club deserves these changes to Twerton it would like to make. The impression I've gained from the handful of correspondents I've engaged with on this thread, is of a people who are out of touch with the Twerton community and have little empathy for those most affected by the coming changes. This includes, for example, those who look set to lose their livelihood. Legalistic, hair-splitting and personalised comments are given in response to deep issues, like the board's failure to inform residents of the negative impacts that these proposals could have. Even the director who chipped in above, doesn't really have any caring comment to make, but only tries to discredit these points by making a personalised attack on the poster (myself). It's a shocking attitude to display. Yet the club wants to have all these things - like tall student blocks that nobody else in Twerton really wants - so it can keep coming to use Twerton space to watch its games. I think that director should either respect the Twerton community or go and do something else. I and my fellow directors have the fullest respect for the Twerton community. One of them was brought up there, at least one other has lived there. My mother and her parents were Twerton residents for many, many years and I have friends who presently live there. So stop your petty accusations and falsehoods. You come across as someone who has to have the last word on everything - I hope that is the case with the above post! comrade powell wrote: I and my fellow directors have the fullest respect for the Twerton community. One of them was brought up there, at least one other has lived there. My mother and her parents were Twerton residents for many, many years and I have friends who presently live there. So stop your petty accusations and falsehoods. I'm happy to believe that some of the directors respect Twerton. But respect doesn't come just by virtue of having some ancestry in a place! As I indicated elsewhere, the actions have to match the rhetoric. So far that hasn't been the case, and your posts certainly do nothing to inspire confidence. There's nothing "petty" or "false" about outlining how the board has neither listened to the community, or been upfront about the problems with its proposals. Or, about discussing the indifference and lack of moral responsibility towards those neighbouring the club. Your proposals envisage having something the size of the Parade looming over the High Street and above people's heads. It's ridiculous -- and there's nothing respectful about that. comrade powell wrote: You come across as someone who has to have the last word on everything - I hope that is the case with the above post! So what happened to the directors wanting to get feedback from the community?! Maybe only if it's feedback they want to hear? Here's a bit of useful feedback. 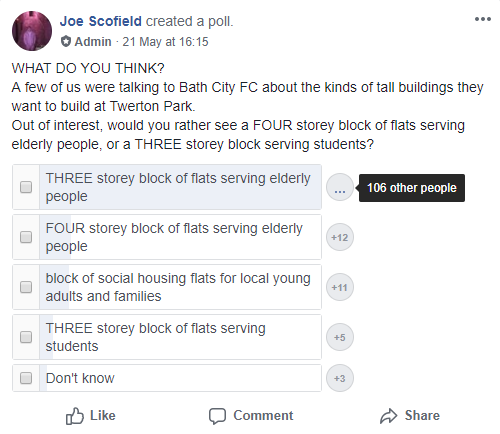 The other day I took this facebook poll exploring how residents felt about accommodation types at Twerton Park. It went wrong early on, with people adding voting options that messed up the original aims of the poll. But look at the strength of community feeling there. 106 people would rather have a three storey block of flats for the elderly, than a three storey block for students. Only 5 people felt the other way. People would even rather have a taller block of flats for the elderly, than a shorter block for students (12 votes to 5). How can the board possibly say that they've "listened" to the community if they ignore feeling like this? The counter-argument would be that the football club can only survive if it has the high revenues derived from student blocks. But the developers should provide an independent audit to prove that they can't balance the books through any other means than massed student accommodation. And incidentally, I'm not student bashing here. My thoughts are with the vulnerable, like the elderly, who lose out to schemes such as this. I realise that I owe Joe Scofield an apology. In one of my posts I may have suggested that he was a NIMBY. Well, in one of his he said something to the extent that he wanted to pass the campaign on the someone who lived nearer to Twerton Park and in his letter published in this weeks Chronicle he gives his address as Southdown. So the irony is that the re-development isn’t even in his “backyard”. As for the letter in the Chronicle, his comments regarding Ken Loach are out of order but I am sure Ken won’t dignify them with a reply, something perhaps we should all have done when this and the other thread started. 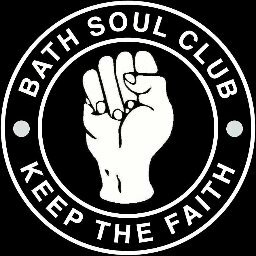 Wednesday 31st October, 2pm-8pm in Reynolds (Western) Limited Lounge at Twerton Park, High Street, Bath, BA2 1DB. (If disabled access is required please call 01225 423087 to make arrangements).